We set out from Winterton this morning along Highway 80, in the pouring rain. We had intended to travel north and around the top of the peninsula to continue along the Baccalieu Trail but that was pointless with the weather the way it was! So we turned about and took a short cut from Heart's Content across to Harbour Grace which is situated on Highway 70 near the end of the scenic trail. We quickly changed our plans and decided to arrive in St John's a day earlier, we had friends to visit there and would be spending a few days with them. Once we arrived in St John's we first headed into town to take care of the shaggy manes that had grown on our heads. We figured we should try to present ourselves in a reasonable fashion even though our current lifestyle resembles that of gypsies! After lucking out with almost immediate hair appointments, we briefly checked out a few of the sights in the city. 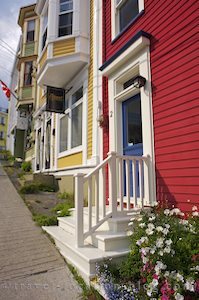 We started out by by walking straight up hill to the back streets of downtown where the iconic row houses stand with their vivid colours of red, blue, orange, and yellow - you name it! We then wandered onto George Street where they were setting up for the annual George Street festival. The festival runs for a week and features a number of popular bands in Canada. Interestingly, the drinking of alcohol in the street - singular (in plastic cups - no bottles) is allowed during this event - a big break from Canada's usual conservative laws towards alcohol. By then it was time to head to the suburbs and visit our friends Pat and Sharon and family who took care of us in typical Newfoundlander fashion - hospitality that's second to none! !